Ashley was ready to take control of her website, but it was a Wordpress site and she knew there had to be an easier way. She reached out to me to share her concerns about potentially trading off her SEO ranking for a more user-friendly platform like Squarespace - but I assured her we could make the move seamless. Using the techniques used in my popular blog article How to Get on The First Page of Google Search, we made the move without even so much as a blip in her SEO. In fact, she started ranking #3 for a keyword we only added with the new Squarespace site. Ashley knew she wanted to refresh her homepage but once we started talking about her business goals, we knew it would take more than fresh content to reach her goals. I worked with Ashley to refine and then apply a color palette that would capture her readers and encourage them to follow a specific path through her site that would end with them filling out her contact form. We transformed the muted palette from her old site - keeping the great elements like large imagery and her gorgeous dominant blue. We refined the use of her feature font using it as a highlight to grab the reader's eye. Together with her updated “value proposition” her already busy business continues to book out each month. Expectant parents are busy and we knew it would be critical for them to access this popular doula service from their phone. We make sure that all elements were easily accessible and very readable no matter what screen size it was being viewed on. While Squarespace automatically readjusts to ensure a mobile friendly design, we made small tweaks like limiting minimum fonts sizes to ensure the site would always be readable and useful for it's visitors. Ashley uses Dubsado to capture leads and invoice her customers. Even though her forms were “Dubsado”, using a little custom coding to match her site’s existing branding made it all look seamless. You would never know they weren’t Squarespace’s built in forms. 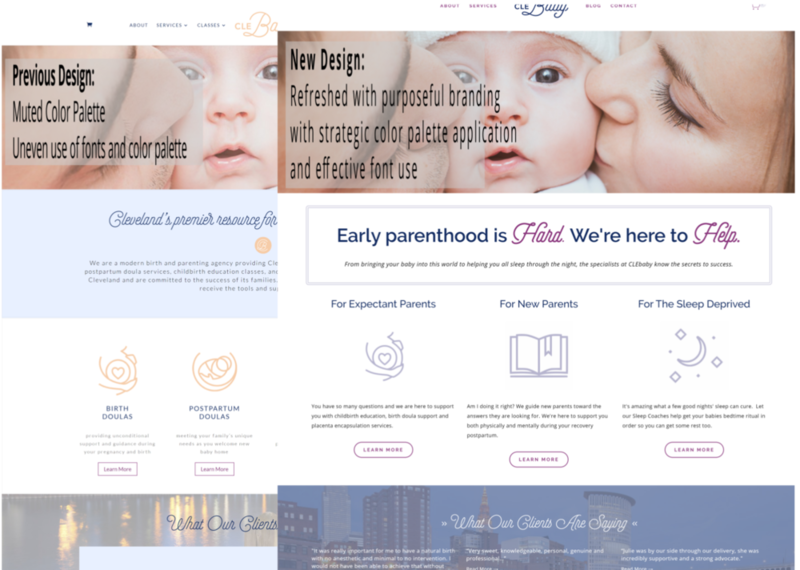 CLEbaby is a doula service that relies on the expertise of it’s staff - so a Staff Directory was high on the list of required features for the new site. I implemented a simple staff directory that was so easy for Ashley to manage, her first editorial act was to add a new doula. Easy peasy!